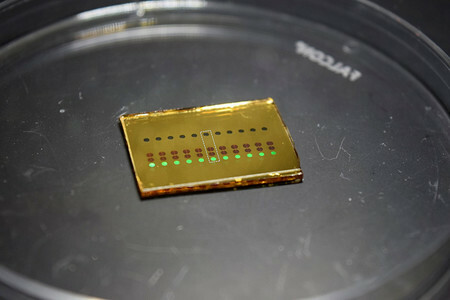 The next generation of electronic devices, ranging from personal health monitors and augmented reality headsets to sensitive scientific instruments that would only be found in a laboratory, will likely incorporate components that use metasurface optics, according to Andrei Faraon, professor of applied physics in Caltech’s Division of Engineering and Applied Science. Metasurface optics manipulate light similarly to how a lens might—bending, focusing, or reflecting it—but do so in a finely controllable way using carefully designed microscopic structures on an otherwise flat surface. That makes them both compact and finely tunable, attractive qualities for electronic devices. However, engineers will need to overcome several challenges to make them widespread. To overcome this limitation, the Faraon group has introduced a technology called “folded metasurface optics,” which is a way of printing multiple types of metasurfaces onto either side of a substrate, like glass. In this way, the substrate itself becomes the propagation space for the light. As a proof of concept, the team used the technique to build a spectrometer, which is a scientific instrument for splitting light into different colors, or wavelengths, and measuring their corresponding intensities. (Spectrometers are used in a variety of fields; for example, in astronomy they are used to determine the chemical makeup of stars based on the light they emit.) 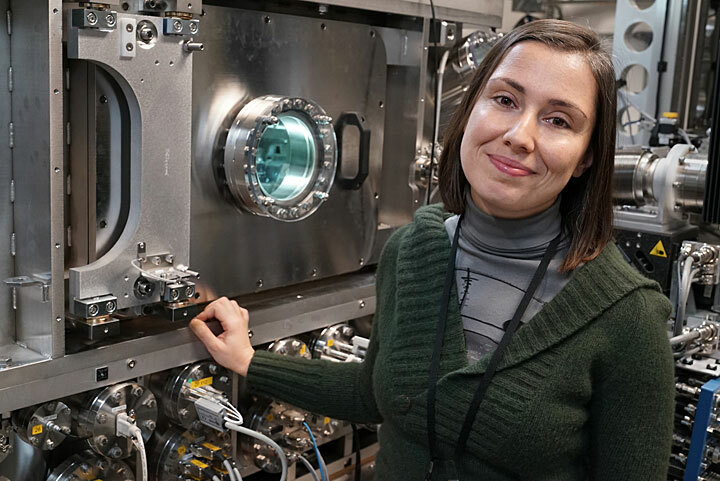 The spectrometer built by Faraon’s team is 1 millimeter thick and is composed of three reflective metasurfaces placed next to each other that split and reflect light, and ultimately focus it onto a detector array. It was fabricated at the Kavli Nanoscience Institute, and its design is described in a paper published by Nature Communications on October 10. A compact spectrometer like the one developed by Faraon’s group has a variety of uses, including as a noninvasive blood-glucose measuring system that could be invaluable for diabetes patients. The platform uses multiple metasurface elements that are fabricated in a single step, so, in general, it provides a potential path toward complex but inexpensive optical systems. The paper is titled “Compact folded metasurface spectrometer.” Co-authors include Caltech graduate students MohammadSadegh Faraji-Dana (MS ’18), Ehsan Arbabi (MS ’17), Seyedeh Mahsa Kamali (MS ’17), and Hyounghan Kwon (MS ’18), and Amir Arbabi of the University of Massachusetts Amherst. This research was supported by Samsung Electronics, the National Sciences and Engineering Research Council of Canada, and the U.S. Department of Energy. Staff performed tests with the undersea optical communications system at the Boston Sports Club pool in Lexington, proving that two underwater vehicles could efficiently search and locate each other. After detecting the remote terminal’s beacon, the local terminal is able to lock on and pull into coarse track in less than one second. Photo courtesy of the research team. Nearly five years ago, NASA and Lincoln Laboratory made history when the Lunar Laser Communication Demonstration (LLCD) used a pulsed laser beam to transmit data from a satellite orbiting the moon to Earth — more than 239,000 miles — at a record-breaking download speed of 622 megabits per second. Now, researchers at Lincoln Laboratory are aiming to once again break new ground by applying the laser beam technology used in LLCD to underwater communications. However, undersea laser communication (lasercom) presents its own set of challenges. In the ocean, laser beams are hampered by significant absorption and scattering, which restrict both the distance the beam can travel and the data signaling rate. To address these problems, the Laboratory is developing narrow-beam optical communications that use a beam from one underwater vehicle pointed precisely at the receive terminal of a second underwater vehicle. This technique contrasts with the more common undersea communication approach that sends the transmit beam over a wide angle but reduces the achievable range and data rate. “By demonstrating that we can successfully acquire and track narrow optical beams between two mobile vehicles, we have taken an important step toward proving the feasibility of the laboratory’s approach to achieving undersea communication that is 10,000 times more efficient than other modern approaches,” says Scott Hamilton, leader of the Optical Communications Technology Group, which is directing this R&D into undersea communication. This positional uncertainty can make it difficult for an undersea terminal to locate and establish a link with incoming narrow optical beams. For this reason, “We implemented an acquisition scanning function that is used to quickly translate the beam over the uncertain region so that the companion terminal is able to detect the beam and actively lock on to keep it centered on the lasercom terminal’s acquisition and communications detector,” researcher Nicolas Hardy explains. Using this methodology, two vehicles can locate, track, and effectively establish a link, despite the independent movement of each vehicle underwater. Once the two lasercom terminals have locked onto each other and are communicating, the relative position between the two vehicles can be determined very precisely by using wide bandwidth signaling features in the communications waveform. With this method, the relative bearing and range between vehicles can be known precisely, to within a few centimeters, explains Howe, who worked on the undersea vehicles’ controls. To test their underwater optical communications capability, six members of the team recently completed a demonstration of precision beam pointing and fast acquisition between two moving vehicles in the Boston Sports Club pool in Lexington, Massachusetts. Their tests proved that two underwater vehicles could search for and locate each other in the pool within one second. Once linked, the vehicles could potentially use their established link to transmit hundreds of gigabytes of data in one session. This summer, the team is traveling to regional field sites to demonstrate this new optical communications capability to U.S. Navy stakeholders. One demonstration will involve underwater communications between two vehicles in an ocean environment — similar to prior testing that the Laboratory undertook at the Naval Undersea Warfare Center in Newport, Rhode Island, in 2016. The team is planning a second exercise to demonstrate communications from above the surface of the water to an underwater vehicle — a proposition that has previously proven to be nearly impossible. The undersea communication effort could tap into innovative work conducted by other groups at the laboratory. For example, integrated blue-green optoelectronic technologies, including gallium nitride laser arrays and silicon Geiger-mode avalanche photodiode array technologies, could lead to lower size, weight, and power terminal implementation and enhanced communication functionality. In addition, the ability to move data at megabit-to gigabit-per-second transfer rates over distances that vary from tens of meters in turbid waters to hundreds of meters in clear ocean waters will enable undersea system applications that the laboratory is exploring. Innovative computational imaging approach could advance applications from brain research to self-driving cars. The camera is compact and inexpensive to construct because it consists of only a diffuser – essentially a bumpy piece of plastic – placed on top of an image sensor. Although the hardware is simple, the software it uses to reconstruct high resolution 3D images is very complex. In Optica, The Optical Society’s journal for high impact research, the researchers show that the DiffuserCam can be used to reconstruct 100 million voxels, or 3D pixels, from a 1.3-megapixel (1.3 million pixels) image without any scanning. For comparison, the iPhone X camera takes 12-megapixel photos. The researchers used the camera to capture the 3D structure of leaves from a small plant. The lensless DiffuserCam consists of a diffuser placed in front of a sensor (bumps on the diffuser are exaggerated for illustration). The system turns a 3D scene into a 2D image on the sensor. After a one-time calibration, an algorithm is used to reconstruct 3D images computationally. The result is a 3D image reconstructed from a single 2D measurement. Image Credit: Laura Waller, University of California, Berkeley. After experimenting with various types of diffusers and developing the complex algorithms, Nick Antipa and Grace Kuo, students in Waller’s lab, discovered that Waller’s idea for a simple light field camera was possible. In fact, using random bumps in privacy glass stickers, Scotch tape or plastic conference badge holders, allowed the researchers to improve on traditional light field camera capabilities by using compressed sensing to avoid the typical loss of resolution that comes with microlens arrays. Although other light field cameras use lens arrays that are precisely designed and aligned, the exact size and shape of the bumps in the new camera’s diffuser are unknown. This means that a few images of a moving point of light must be acquired to calibrate the software prior to imaging. The researchers are working on a way to eliminate this calibration step by using the raw data for calibration. They also want to improve the accuracy of the software and make the 3D reconstruction faster. The new camera will be used in a project at University of California Berkeley that aims to watch a million individual neurons while stimulating 1,000 of them with single-cell accuracy. The project is funded by DARPA’s Neural Engineering System Design program – part of the federal government’s BRAIN Initiative – to develop implantable, biocompatible neural interfaces that could eventually compensate for visual or hearing deficits. As a first step, the researchers want to create what they call a cortical modem that will “read” and “write” to the brains of animal models, much like the input-output activity of internet modems. The DiffuserCam will be the heart of the reading device for this project, which will also use special proteins that allow scientists to control neuronal activity with light. “Using this to watch neurons fire in a mouse brain could in the future help us understand more about sensory perception and provide knowledge that could be used to cure diseases like Alzheimer’s or mental disorders,” said Waller. Although newly developed imaging techniques can capture hundreds of neurons firing, how the brain works on larger scales is not fully understood. The DiffuserCam has the potential to provide that insight by imaging millions of neurons in one shot. Because the camera is lightweight and requires no microscope or objective lens, it can be attached to a transparent window in a mouse’s skull, allowing neuronal activity to be linked with behavior. Several arrays with overlying diffusers could be tiled to image large areas. The open source software for the DiffuserCam is available on the project page: DiffuserCam: Lensless Single-exposure 3D Imaging. 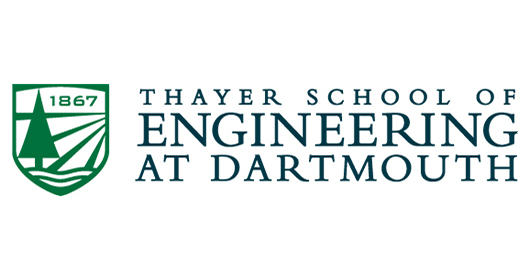 Engineers from Dartmouth’s Thayer School of Engineering have produced a new imaging technology that may revolutionize medical and life sciences research, security, photography, cinematography and other applications that rely on high quality, low light imaging. Documented in the Dec. 20 issue of The Optical Society’s OSA Optica, the new QIS technology is able to reliably capture and count the lowest level of light, single photons, with resolution as high as one megapixel, or one million pixels, and as fast as thousands of frames per second. Plus, the QIS can accomplish this in low light, at room temperature and while using mainstream image sensor technology, according to the Optica article. Previous technology required large pixels or cooling to low temperatures or both. Building this new imaging capability in a commercially accessible, inexpensive process is important, said Fossum, so he and his team made it compatible with the low cost and mass production of today’s CMOS image sensor technology. They also made it readily scalable for higher resolution, with as many as hundreds of megapixels per chip. “That way it’s easier for industry to adopt it and mass produce it,” said Fossum, who was recognized earlier this month at Buckingham Palace for his role in developing the CMOS image sensor. On Dec. 6, Charles, Prince of Wales, awarded Fossum the engineering equivalent of the Nobel Prize, the Queen Elizabeth Prize for Engineering. “The QIS is a revolutionary change in the way we collect images in a camera,” said Jiaju Ma who co-authored this month’s Optica paper with Fossum, Saleh Masoodian and researcher Dakota Starkey who is currently pursuing his PhD at Thayer. 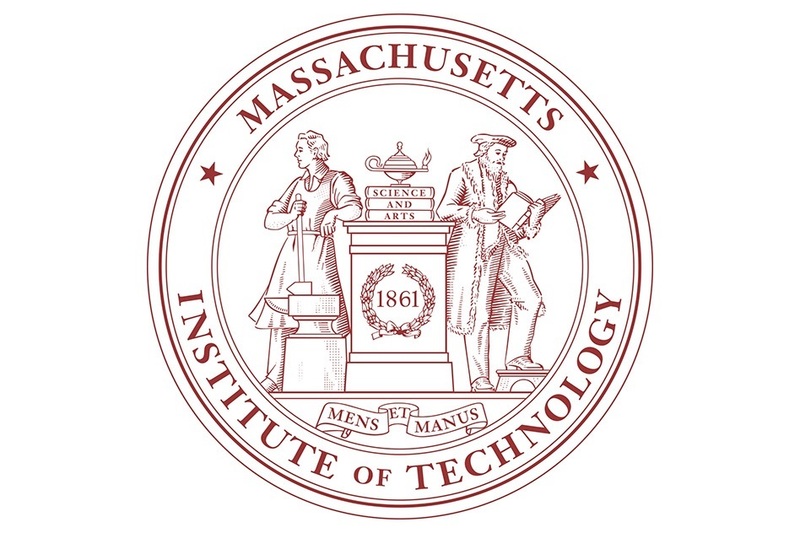 Ma and Masoodian received their PhDs in electrical and electronics engineering from Thayer and are co-inventors of the QIS with Fossum. 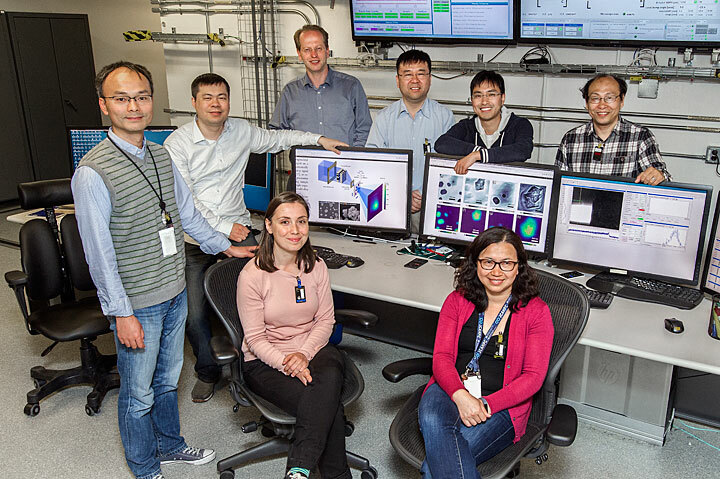 While the current QIS resolution is one megapixel, the team’s goal is for the QIS to contain hundreds of millions to billions of these jots, all scanned at a very fast rate, said Ma. 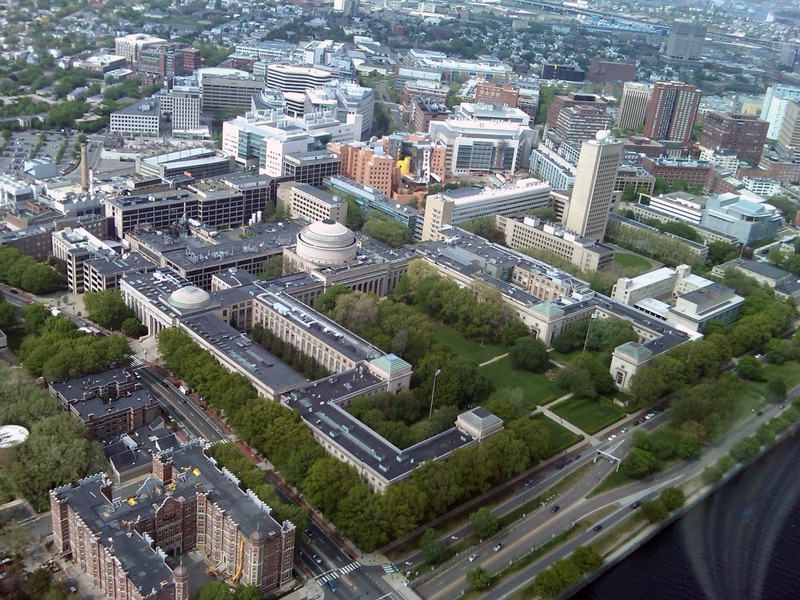 Dartmouth College is a private, Ivy League, research university in Hanover, New Hampshire, United States. Incorporated as the “Trustees of Dartmouth College”, it is one of the nine Colonial Colleges founded before the American Revolution. Dartmouth College was established in 1769 by Eleazar Wheelock, a Congregational minister. After a long period of financial and political struggles, Dartmouth emerged in the early 20th century from relative obscurity, into national prominence. Comprising an undergraduate population of 4,307 and a total student enrollment of 6,350 (as of 2016), Dartmouth is the smallest university in the Ivy League. Its undergraduate program, which reported an acceptance rate around 10 percent for the class of 2020, is characterized by the Carnegie Foundation and U.S. News & World Report as “most selective”. Dartmouth offers a broad range of academic departments, an extensive research enterprise, numerous community outreach and public service programs, and the highest rate of study abroad participation in the Ivy League. “Metalenses” created with photolithography could change the nature of imaging and optical processing. Lenses are almost as old as civilization itself. The ancient Egyptians, Greeks, and Babylonians all developed lenses made from polished quartz and used them for simple magnification. Later, 17th-century scientists combined lenses to make telescopes and microscopes, instruments that changed our view of the universe and our position within it. Now lenses are being reinvented by the process of photolithography, which carves subwavelength features onto flat sheets of glass. Today, Alan She and pals at Harvard University in Massachusetts show how to arrange these features in ways that scatter light with greater control than has ever been possible. They say the resulting “metalenses” are set to revolutionize imaging and usher in a new era of optical processing. Lens making has always been a tricky business. It is generally done by pouring molten glass, or silicon dioxide, into a mold and allowing it to set before grinding and polishing it into the required shape. This is a time-consuming business that is significantly different from the manufacturing processes for light-sensing components on microchips. Metalenses are carved onto wafers of silicon dioxide in a process like that used to make silicon chips. No image credit. So a way of making lenses on chips in the same way would be hugely useful. It would allow lenses to be fabricated in the same plants as other microelectronic components, even at the same time. She and co show how this process is now possible. The key idea is that tiny features, smaller than the wavelength of light, can manipulate it. For example, white light can be broken into its component colors by reflecting it off a surface into which are carved a set of parallel trenches that have the same scale as the wavelength of light. Physicists have played with so-called diffraction gratings for centuries. But photolithography makes it possible to take the idea much further by creating a wider range of features and varying their shape and orientation. Since the 1960s, photolithography has produced ever smaller features on silicon chips. In 1970, this technique could carve shapes in silicon with a scale of around 10 micrometers. By 1985, feature size had dropped to one micrometer, and by 1998, to 250 nanometers. Today, the chip industry makes features around 10 nanometers in size. Visible light has a wavelength of 400 to 700 nanometers, so the chip industry has been able to make features of this size for some time. But only recently have researchers begun to investigate how these features can be arranged on flat sheets of silicon dioxide to create metalenses that bend light. The process begins with a silicon dioxide wafer onto which is deposited a thin layer of silicon covered in a photoresist pattern. The silicon below is then carved away using ultraviolet light. Washing away the remaining photoresist leaves the unexposed silicon in the desired shape. She and co use this process to create a periodic array of silicon pillars on glass that scatter visible light as it passes through. And by carefully controlling the spacing between the pillars, the team can bring the light to a focus. Specific pillar spacings determine the precise optical properties of this lens. For example, the researchers can control chromatic aberration to determine where light of different colors comes to a focus. In imaging lenses, chromatic aberration must be minimized—it otherwise produces the colored fringes around objects viewed through cheap toy telescopes. But in spectrographs, different colors must be brought to focus in different places. She and co can do either. Neither do these lenses suffer from spherical aberration, a common problem with ordinary lenses caused by their three-dimensional spherical shape. Metalenses do not have this problem because they are flat. Indeed, they are similar to the theoretical “ideal lenses” that undergraduate physicists study in optics courses. Of course, physicists have been able to make flat lenses, such as Fresnel lenses, for decades. But they have always been hard to make. The key advance here is that metalenses, because they can be fabricated in the same way as microchips, can be mass-produced with subwavelength surface features. She and co make dozens of them on a single silica wafer. Each of these lenses is less than a micrometer thick, with a diameter of 20 millimeters and a focal length of 50 millimeters. “We envision a manufacturing transition from using machined or moulded optics to lithographically patterned optics, where they can be mass produced with the similar scale and precision as IC chips,” say She and co.
And they can do this with chip fabrication technology that is more than a decade old. That will give old fab plants a new lease on life. “State-of-the-art equipment is useful, but not necessarily required,” say She and co.
Metalenses have a wide range of applications. The most obvious is imaging. Flat lenses will make imaging systems thinner and simpler. But crucially, since metalenses can be fabricated in the same process as the electronic components for sensing light, they will be cheaper. So cameras for smartphones, laptops, and augmented-reality imaging systems will suddenly become smaller and less expensive to make. They could even be printed onto the end of optical fibers to acts as endoscopes. Astronomers could have some fun too. These lenses are significantly lighter and thinner than the behemoths they have launched into orbit in observatories such as the Hubble Space Telescope. A new generation of space-based astronomy and Earth observing beckons. But it is within chips themselves that this technology could have the biggest impact. The technique makes it possible to build complex optical bench-type systems into chips for optical processing. And there are further advances in the pipeline. 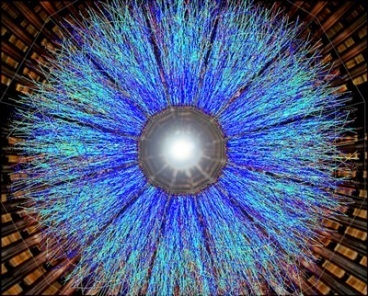 One possibility is to change the properties of metalenses in real time using electric fields. That raises the prospect of lenses that change focal length with voltage—or, more significant, that switch light. Large Area Metalenses: Design, Characterization, and Mass Manufacturing. No Journal reference. The camera is designed to help doctors track medical tools known as endoscopes that are used to investigate a range of internal conditions. The new device is able to detect sources of light inside the body, such as the illuminated tip of the endoscope’s long flexible tube. Images from a new camera that can detect tiny traces of light through the body’s tissues. Here, the camera is detecting light emitted from a medical device known as an optical endomicroscope whilst in use in sheep lungs. Image on left shows light emitted from the tip of the endomicroscope, revealing its precise location in the lungs. Right image shows the picture that would be obtained using a conventional camera, with light scattered through the structures of the lung. The new camera takes advantage of advanced technology that can detect individual particles of light, called photons. Experts have integrated thousands of single photon detectors onto a silicon chip, similar to that found in a digital camera. The technology is so sensitive that it can detect the tiny traces of light that pass through the body’s tissue from the light of the endoscope. It can also record the time taken for light to pass through the body, allowing the device to also detect the scattered light. By taking into account both the scattered light and the light that travels straight to the camera, the device is able to work out exactly where the endoscope is located in the body. Researchers have developed the new camera so that it can be used at the patient’s bedside. The project – led by the University of Edinburgh and Heriot-Watt University – is part of the Proteus Interdisciplinary Research Collaboration, which is developing a range of revolutionary new technologies for diagnosing and treating lung diseases. Proteus is a collaboration between the Universities of Edinburgh and Bath and Heriot-Watt University. 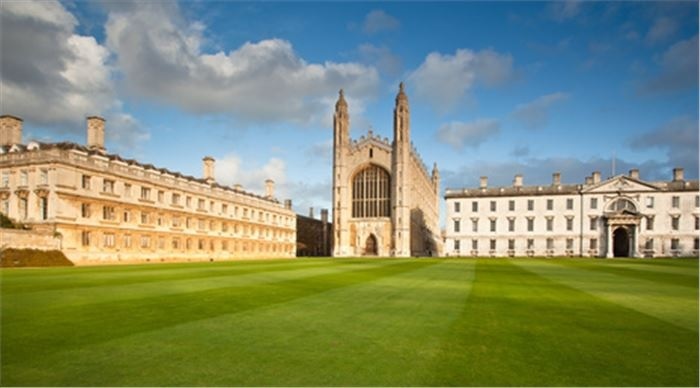 It is funded by the Engineering and Physical Sciences Research Council. The research is published in the journal Biomedical Optics Express.